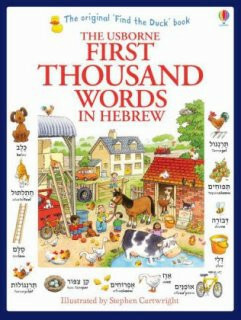 Produktinformationen "The Usborne First Thousand Words in Hebrew"
The classic bi-lingual Hebrew/English word book, illustrated by Stephen Cartwright. A thousand everyday words illustrated with busy scenes and labelled pictures to help children learn key Hebrew vocabulary.Heather Amery, geboren in Bath, lebt heute in London. Die vielseitige Autorin hat bereits mehr als 100 Bücher für Kinder geschrieben von ABC-Büchern über Bibelgeschichten bis zu griechischen Sagen. Unser Kommentar zu "The Usborne First Thousand Words in Hebrew"